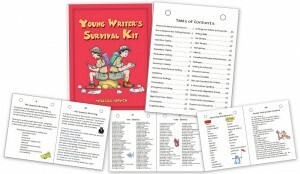 You’ve set up a good writing space, have your supplies – pencils, journals, resource materials. Now what?!! 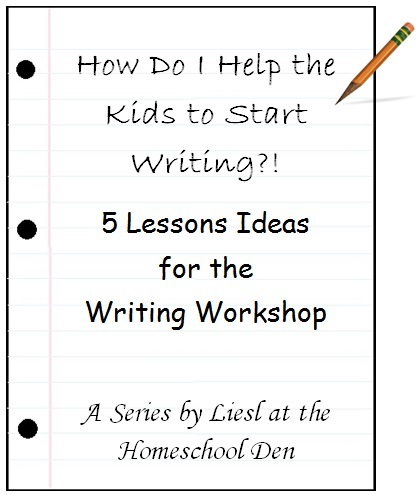 This is the second in a series of 5 posts with lesson ideas to help young writers get started on their writing journey. Be sure to read the introduction to this series in last Monday’s post, Day 1. Here are some of our first mini-lesson topics. 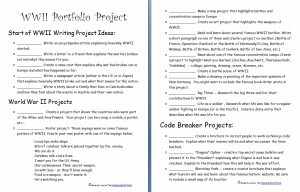 I used mentor texts and picked them apart to help the kids see some of the elements that make for good writing. What makes a good book or story? Make your story come alive with details and description. You can use these lessons in any order. What do you think of these sentences? Do they tell us much? I went to the park and it was fun. My friend was nice to me. 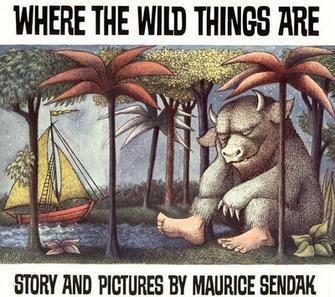 Mentor Text: Now we’re going to read Where the Wild Things Are. Let’s really listen to the words the author uses and the descriptive language he uses. How did Max’s room change? What were the monsters like? Even without the illustrations do you have a good idea of what they looked like? The monsters rolled their terrible eyes, gnashed their terrible teeth and showed their terrible claws. The author worked very hard to create pictures in your mind that would stick with you even after you finished the book. When you write today, you might try to include scenes that come alive for your reader. You might try to include details that tell the reader what is happening… what they might see, hear, taste or smell if they were in the world you are writing about. Authors try to include specific information. When you go off to write, you might want to keep this in mind. Here is another example of a mentor text you could use with this lesson. Discussion with the Kids: Start with the activity on the previous page about making sentences more descriptive and sharing specific details. 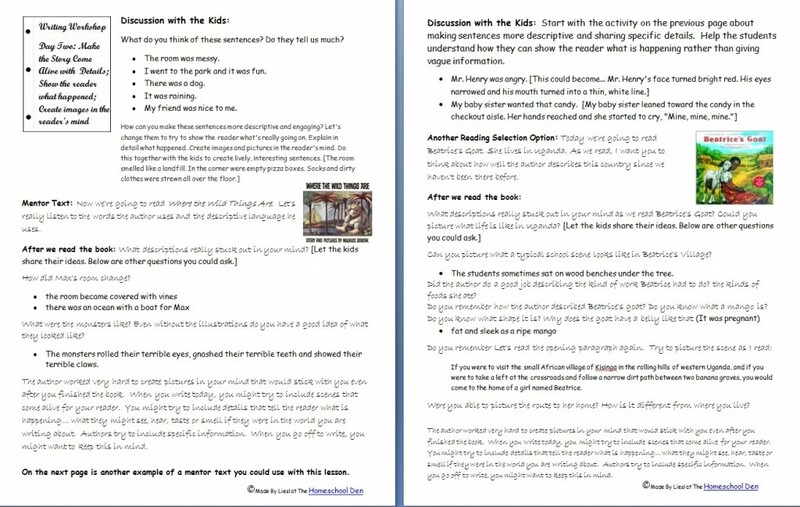 Help the students understand how they can show the reader what is happening rather than giving vague information. 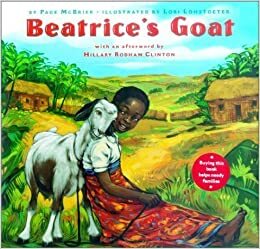 Reading Selection:Today we’re going to read Beatrice’s Goat. She lives in Uganda. As we read, I want you to think about how well the author describes this country since we haven’t been there before. Can you picture what a typical school scene looks like in Beatrice’s Village? The students sometimes sat on wood benches under the tree. Did the author do a good job describing the kind of work Beatrice had to do? the kinds of foods she ate? If you were to visit the small African village of Kisinga in the rolling hills of western Uganda, and if you were to take a left at the crossroads and follow a narrow dirt path between two banana groves, you would come to the home of a girl named Beatrice. Were you able to picture the route to her home? How is it different from where you live? We set the timer for 10 minutes. When we were all done, we got back together. I asked if they wanted to share what they wrote. After our lesson, I shared my writing (which is in the download below). Creating a Writing Workshop Post #3: This post is about Mini-Lessons during writing time, mentor texts and includes reviews of 8 or 9 writing books that you might find helpful. Writing Workshop: Dr. Seuss Style: The kids and I had fun writing in the style of Dr. Seuss! Writing Activity to Spark Kids’ Imagination! Write a speech or a letter to the president on why your animal needs protection in the wild. Menu: Create a humorous menu at a restaurant where your animals would like to eat. Writing Workshop Rules! 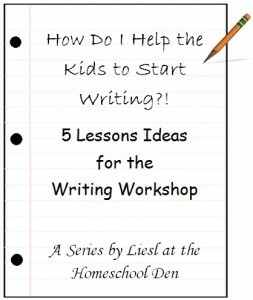 Why the Writing Workshop continues to work so well in our homeschool. Writing Workshop Mini-Lesson: Rules for Writing and the Story Writing Process — Have your kids read the Plot Chicken? We started our Writing Workshop this year off with this book. What a great buk, buk!! 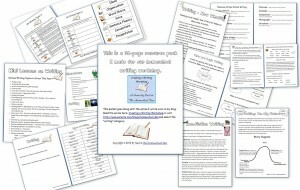 In fact, I liked it so much that I created a chicken writing rules printable to go along with the book! Adding Details Exercise Don’t miss this one, the kids LOVED this activity! !